MK Avi Dichter welcomes approval of “pay-to-slay law”. 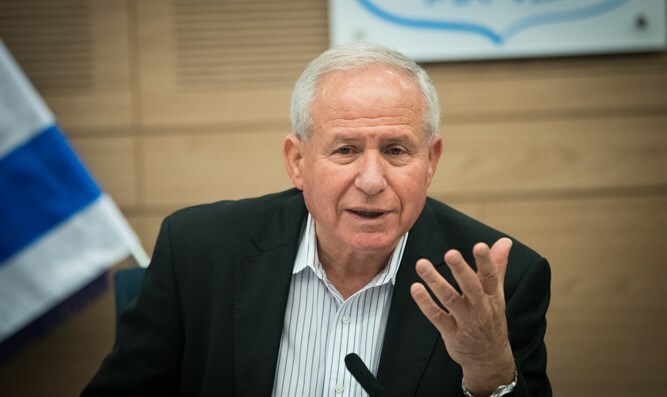 MK Avi Dichter (Likud), chairman of the Foreign Affairs and Defense Committee, on Monday evening expressed his satisfaction following the approval of the “pay-to-slay law” which he co-authored along with MK Elazar Stern (Yesh Atid). The law stipulates that tax funds to the Palestinian Authority (PA) will be withheld as long as the PA continues to pay salaries to terrorists who attacked Israeli citizens. "After more than a year, there is no doubt that the time has come for the law to pass. It was important to us to make sure that the cutting off of funds to the PA is automatic and not subject to the discretion of the Cabinet. We all understood that in the end we want to offset money from the Palestinian Authority so that it will not be transferred to terrorists. There were problems as to how this would be done and what will be done with the funds. The discussion was practical,” Dichter told Arutz Sheva. Asked about the disappointment of some of the terror victims' families over the final wording of the law, he said, "Our original plan was to freeze the funds and that's it. The government came up with the idea of taking the money and turning it into a budgetary source for financing compensation for families of terror victims. We looked into this with the Attorney General and with experts on the subject, and it was completely clear to us that if we enter this niche, we may be busy over the next few years in international legal courts on this issue and miss the purpose of the law." "I believe that the bereaved families understood that the goal is to put pressure on the Palestinian Authority and not find a budget source for compensation," Dichter added. "These are really people who are not serious. They are not concerned about the interests of the Arabs of Israel nor are they concerned about the interests of the State of Israel. They did not bother me in the past and will not bother me in the future,” said Dichter.